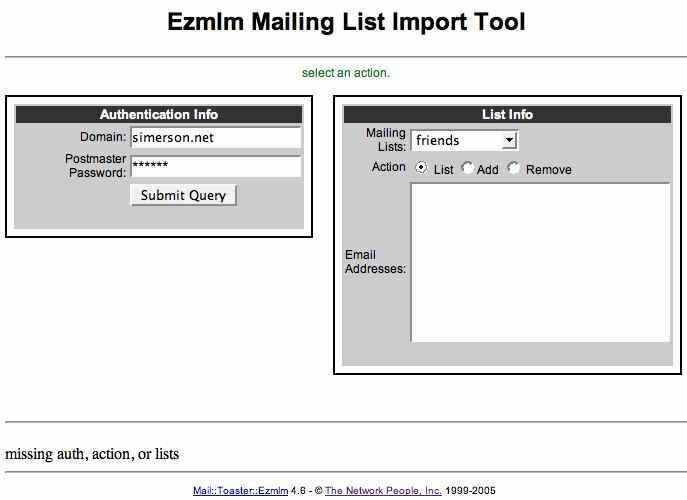 ezmlm.cgi is a CGI frontend to ezmlm mailing lists. It allow batch subscriber additions and deletions to an Ezmlm list. I get "insecure dependency" errors, what's wrong? The Mail::Ezmlm doesn't check the form inputs for validity. Since ezmlm.cgi must run suid (so that it has access to the vpopmail authentication functions), perl does taint checks and it fails the tests. There is a patch in the Mail::Toaster contrib directory that must be applied (until the Mail::Ezmlm author gets around to adding it to the released version.